Singer/rapper/songwriter gnash (whose birth name is Garrett Nash) has had a solid impact as a pop & hip-hop artist during the past few years. He has previously released three EPs (called u, me and us), and he has released his debut album, we (on Atlantic Records). Impressively, he’s also had two hit songs on the Billboard Hot 100 chart: his Top 10 hit “i hate u, i love u” featuring Olivia O’Brien, and his feature with MAX on the Top 20 hit, “Lights Down Low.” gnash co-wrote both songs. Currently, gnash has launched a U.S. tour as a headliner. Called the broken hearts club tour, he will be playing many cities including Toronto, Chicago, Denver, Los Angeles and San Francisco. Then in early March, he will be performing shows overseas in the U.K., Germany, Netherlands, France and Belgium. DK: You’ve previously released three EPs, but we is your first full album. Can you talk about the making of this album, and the growth of your music from your EPs to your album? gnash: Yes, we is my debut album, and I want to start by saying that I’m extremely proud of it. I worked on it for about two years, and it took me a long time to express some of the things that I was thinking about. I think the most important thing when it comes to growth from the last projects, is that I’ve grown a lot as a person as Garrett, and I think that reflects in the music. When I was making we, it was important to write songs that I thought everybody could connect with. I was trying to channel what I felt that people needed to hear, and also what I needed to hear myself say. DK: Your EPs were called u, me and us, and now your album is called we. Can you talk about how you came up with these titles, leading up to we? gnash: I think that u, me and us were the journey through a breakup and finding myself, and then moving on to something new. But it’s also the universality of that journey, and just being in love is what us was about, and I think that we is about everybody coming together over a common feeling. The mission statement of the album is…if we feel together, then we’ll feel better. And what I mean by that is, if we all are feeling one common thing at the same time, whether that’s a song in particular or the album as a whole, then everybody that connects is going to feel better because they know they’re less alone. So when I was writing we, [I was hoping that] people would latch onto these messages and feel empowered by them. DK: I read that you’re from Los Angeles. How did you get started as a musician and songwriter? gnash: I grew up in L.A., and I took guitar lessons here and there. But I’d say that the most important thing was that I started DJ-ing when I was about 13. Around that time, I started learning how to play guitar by playing Jack Johnson songs, and I think that [DJ-ing and playing guitar] grew naturally in parallel to each other. And so by the time I was getting out of college, I kind of merged the two worlds—I loved playing guitar and singing covers, and also being a party DJ. So I merged the two worlds by creating the Gnash project where I was kind of doing both. DK: Besides being inspired by Jack Johnson, how did the hip-hop & rap part of you come through? Was it by being a DJ? gnash: Yeah, I’d say that being a DJ would be how that came into play. But you know, I don’t really think of myself as a rapper or singer or whatever else. I just think of myself as an expression of feelings. Whatever the song calls for, is how I’m going to present that feeling. And so I’ve got my different styles. DK: I like your song “imagine if” from your new album. What inspired you to co-write this song? gnash: Actually, in an awesome twist of fate, “imagine if” was written by a friend of mine, (hit songwriter) Jason Reeves. I was sent that song and it was one of the first songs I heard after basically being more depressed than I’d ever been in my life. When that song came into my email and I heard it, I started crying, because I knew that I needed to hear that song. And I knew that I needed to be the vehicle to bring that song to other people. I did make a couple changes here and there with “imagine if,” but I think that it’s important to recognize the songwriter, and Jason Reeves wrote that song and I’m extremely thankful for him. DK: A key song on your album is “dear insecurity” (feat. Ben Abraham) which has a lot of depth to the lyric. In a recent interview, you said that it took you a long time to finish this song. Can you talk about writing this song? gnash: With “dear insecurity,” I was finishing up the album sessions, and friend of mine named Ben Abraham came over. He played me the chorus idea for “dear insecurity,” and when I heard him sing it, I knew that I needed his voice in that message for my album. And so I started writing some verses to it, and it ended up taking about eight months to finish the song. I knew the song was done when I did the bridge, because [I felt] that I really owned it. Every single word in it is honest, and I’m extremely proud of it. DK: Another key song is “the broken hearts club,” and your current tour is named after this song. What inspired you to write this song? gnash: I wrote the “the broken hearts club” where I am now, which is in Nashville with my friend, (hit songwriter) Jimmy Robbins. We set out to make a song that people could sing like an anthem, to know that they’re not alone. And so writing “the broken hearts club” was really important to us…we wrote it in a style where people could sing and chant, “We’re the newest members of the broken hearts club.” I wanted to make sure everybody could sing along with it, and sing it like they meant it. I knew that it’s a song that if I were to go to place like an imaginary broken hearts club, where there are people who were feeling bummed and they had broken hearts, I wanted to have a song we could all sing together. The point of the song is, we need to come together more often. We’re so separated over the world we live in. We don’t get to really come together and talk about how we feel, and so the broken hearts club is a place where the lonely can feel less lonely. DK: I wanted to ask you about your hit song, “i hate u, i love u.” What inspired you to write this song, and how did you connect with Olivia O’Brien? gnash: Again, it’s important to always give credit to the people who [start creating] the song and bring the song to the table. And in this case, I found Olivia on Soundcloud when she was 15 and doing covers of songs. She did a cover of one of my songs and I thought her voice was fantastic. So I reached out to her and said, “If you ever write anything original, let me know.” And she shot me the demo for “i hate u, i love u,” and I heard and loved it, so I wanted to help her bring that song into the world and produce it out. So I jumped on it, and I did a verse on it, and we put it on my Soundcloud, just to bring more attention to her. That was really the goal that I had in mind. And then it just went and went and went (and became a worldwide hit). I think Olivia is an incredible songwriter, and I’m thankful to her for bringing me that song and for us doing that together. 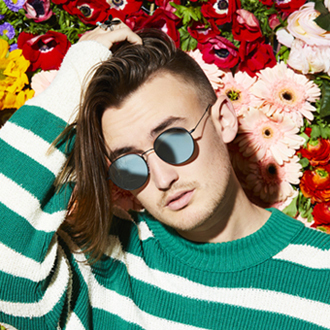 Here’s the video of gnash’s hit, “i hate u, i love u,” feat. Olivia O’Brien. DK: Last year, you also had a hit with MAX on his song, “Lights Down Low.” How did you hook up with MAX and add your verse to this song? gnash: Max and I were talking about working on some music together, and then he suggested doing a remix of this song that he had out already, called “Lights Down Low.” So he shot me an open second verse for it, and I turned the verse around the same day, because I really loved the song. Then I shot it right back to him. And then cut to a year later…it’s all over the radio and he was working harder than anyone I’ve ever seen, to make sure that everybody heard that song. So I’m extremely thankful for him as well, and he’s an awesome dude.